After all the necessary injections and vaccinations, and one week's draft leave - which, unfortunately, Bernard spent recovering from the effects of the vaccination - the Company were issued with Tropical Kit and embarked for an unknown destination. The war-time saying 'walls have ears' was taken very seriously. The Tropical Kit was soon recalled, having been used only to confuse 'Gerry'. The Company landed in Cherbourg, and half travelled to Rennes and half to Nantes. Bernard would describe the following few months as 'cushy'. There was work, of course, and there was always plenty of work for a 'chippy' - or joiner - like him. His apprenticeship with Stapleton at Cotmanhay stood him in good stead. There was also time to relax and sunbathe in the South of France. Time to be befriended by local families and converse in a most effective pigeon French. Those halcyon days were short lived. The German army pushed forward, and Bernard found himself rapidly transferred, because of his height, to the Military Police Corps escorting Convoys up to the Front, and bringing stricken refugees away from the fighting zone. 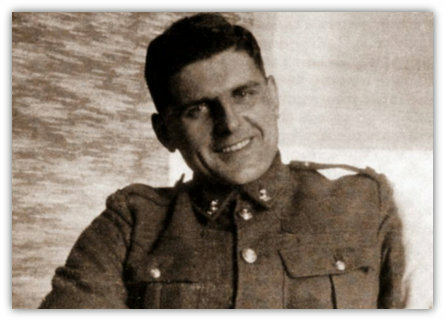 It was whilst on duty near Arras in Northern France that Bernard received injuries which were eventually to lead to his discharge from the war. It is not known whether the injuries were caused by artillery bombardment or by a land mine. Whatever the cause, Bernard was reported as missing, believed killed in action. Thanks to the kindness of the Field Hospital Chaplain, the Rev. Rawthorne, the Mellor family in Ilkeston, and fiancée Mary, were notified of Bernard's survival. Shortly after Dunkirk Bernard was shipped home. There followed a terrible period of recuperation and convalescence. The visible wounds healed more rapidly than the effects of shell-shock and the horrors of war. However, Bernard did recover. He married his one, true, love Mary Hardy. He went on to establish himself as West Hallam's joiner and Undertaker. From 1942 until his retirement in 1982 Bernard said 'goodbye' to free time, and devoted himself to the care of the deceased and the bereaved. The influence of such good men as his own father, who graduated from being an acolite at Holy Trinity Church, Ilkeston, to becoming a local Lay Reader, and Canon Harry Price, have left their mark. For Bernard is a man of great faith. His loyal service to his fellow man, be it acting as Scout Leader, leader of a Bible Group, Sunday School Superintendent, or sharing the sadness of others, is proof of his personal beliefs. He is not afraid to speak of the healing power of the Holy Spirit. He is not afraid to help and encourage others on the Christian road. There are many who are grateful for Bernard's guidance in their lives. The counterpart of this very public figure is: Bernard the devoted family man. His wife and four daughters - sons-in-law and grandchildren know of his great need for the warmth and humour of the family. Here is a man who has known that to succeed may mean to be dogmatic; that to survive war is a miracle; that to have faith is to share it. This handsome patriarch still has a humorous twinkle in his eye and his placid Mary by his side. He is not averse to counting his blessings and thanking his God. Bernard passed away on January 29th 1985 aged 67 years. As a craftsman he was first rate, he made and fixed the oak alter rails in St Wilfrid's in memory of his parents Frank Boden Mellor and Edith Mellor. He also made the oak flower stands in the sanctuary, the seat outside the church gates and the stocks in Mapperley. to mark the fact that on 28 May 1267 King Henry III granted to Simone De Arden the right to hold a weekly market.